A checkbox can be used to do something when the checkbox is selected. In this example, there will be three check boxes and a submit button. You can then use a programming language to do something based on the check box that was selected. 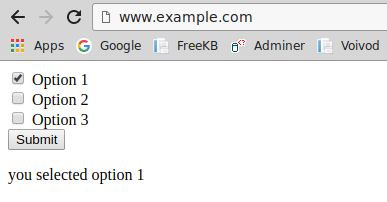 In this example, PHP is used to display the option that was selected. You could do something similar in other programming languages, such as C or Java. In this example, after selecting option 1 and selecting Submit, "you selected option 1" is displayed.